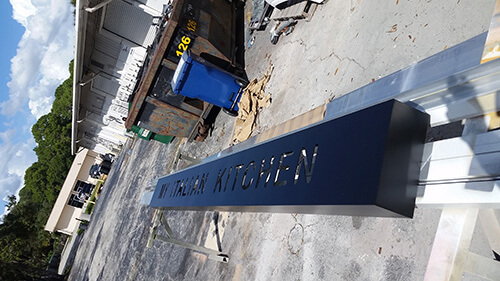 Outdoor signs for businesses not only help promote your business but can also merge cost-effectiveness and aesthetic quotient by making them grab the attention of people on the roads. 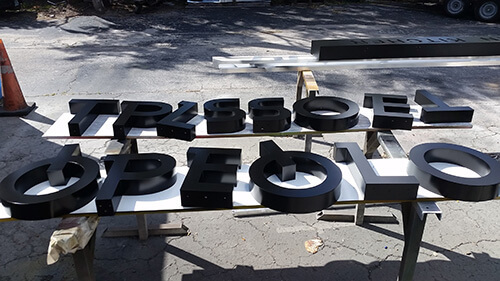 With flexibility in terms of location, together with endless creative possibilities in terms of design and messaging, an exterior sign can make your offerings the next big thing on someone’s buying list. And to create a greater impact, bigger is always better. 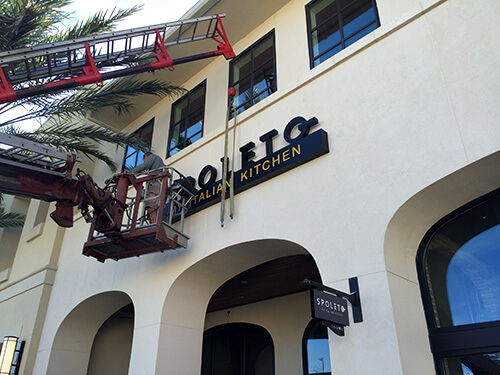 That’s exactly what we kept in mind when we handled Spoleto’s exterior signage requirements for the Windermere location. 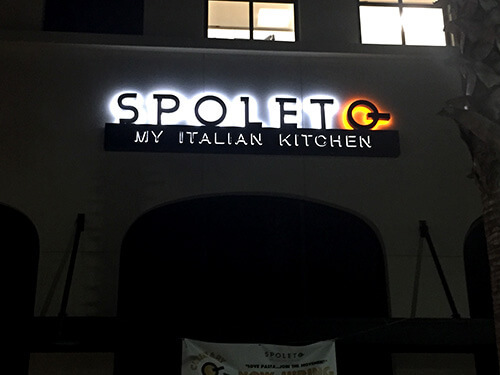 The restaurant chain of Spoleto is known for blending its fast and fresh-casual service with the sophistication of gourmet food for a unique Italian restaurant experience. With its eyes on the USA, Spoleto looks to expand its operations from Brazil to the land of opportunities with their start in the Orlando market. 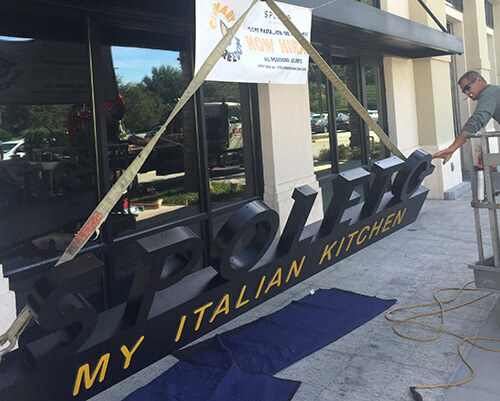 For its restaurant in the town of Windermere (in Orange County, FL), Spoleto hired Citrus Sign Studio to permit, design, fabricate and install its new exterior signage. Orange County, FL has a very strict sign ordinance for The Groves shopping center in Windermere, Florida. Putting an outdoor sign in Orange County requires you to have proper permits and follow the sign ordinances. Getting a sign permit requires a plan drawn to scale that indicates the size, location, and copy area of the planned sign relative to physical markers, property lines, and other signage on the proposed grounds of the sign. Other than the plans, a legal narrative of the parcel of land, the parcel’s street address on which the sign will be, the proposed sign owner’s name and address and the land owner’s name and address are also required. Citrus Sign Studio adhered to the strict sign ordinance and regulations but had some extremely challenging permit issues with respect to the design specifications that are allowed in The Groves shopping center. But the challenges were met successfully to get approval for the county permits. 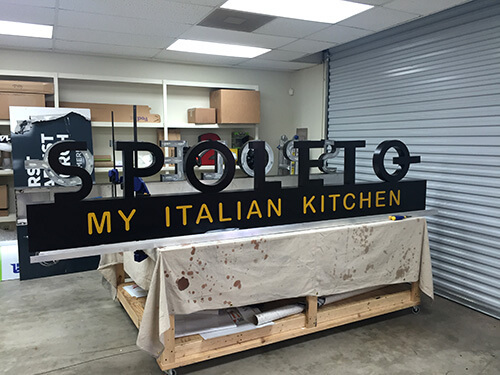 We exceeded the expectations of Spoleto with our innovative approach and a new look for exterior signage business sign was created. The look matched the restaurant chain’s motto of spreading “Culinary Freedom” and showcased simple yet attractive letters to bring forward the transparent and unique Italian culinary experience that Spoleto is famous for offering to its patrons. 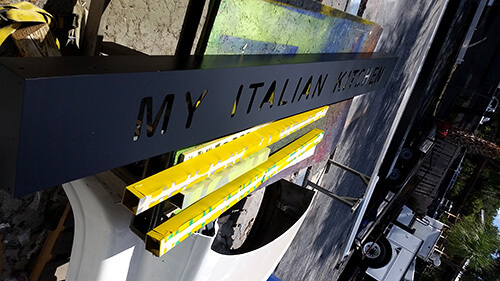 After designing the exterior signage and getting county permits together with client approval, Citrus Sign Studio fabricated the sign with Spoleto’s halo lite channel letters going atop the back lite light box with push-through acrylic “MY ITALIAN KITCHEN” letters. Lifting the sign up in the air above the main entrance to fix it on the wall was tricky due to its weight. phrase makes the new sign easily visible to all from a distance even when it is dark.